A well-known 'superbug' which was thought to have been a static or non-motile organism has been observed showing signs of active motility by scientists at The Universities of Nottingham and Sheffield. Methicillin-resistant Staphylococcus aureus, or MRSA, is the bug responsible for several infections in humans ranging from superficial to life-threatening which are difficult to treat because of antibiotic resistance. Now for the first time the scientists have shown that S. aureus, a spherical bacterium with no propulsive tail or appendages, may be capable of a form of 'active' motility and moving independently. Motility is central to bacterial behaviours, such as biofilm formation, virulence and host colonisation so the discovery, published in Scientific Reports could have implications for future clinical treatments. Dr Steve Diggle from The University of Nottingham's School of Life Sciences, said: "Our research has focused on observing the formation of dendrites—branch-like structures that emerge from the central colony of bacteria. Using high powered microscopy, we saw that the bacteria can spread across the surface of an agar plate in structures that we have called 'comets'. These advance outwards and precede the formation of dendrites. We have observed and photographed the comets 'seeding' cells behind them, without losing mass, which then grow into observable dendrites. "After 8 hours of colony growth, the comet heads are the main source of movement. Cells in the tail follow the comet heads for a while, while bacteria further away no longer move. Our time-lapse video shows the whole remarkable process." The researchers found the comet heads are composed of aggregates of S. aureus cells held together by a matrix of slime and display no observable pili or flagella (propulsive tails or appendages). 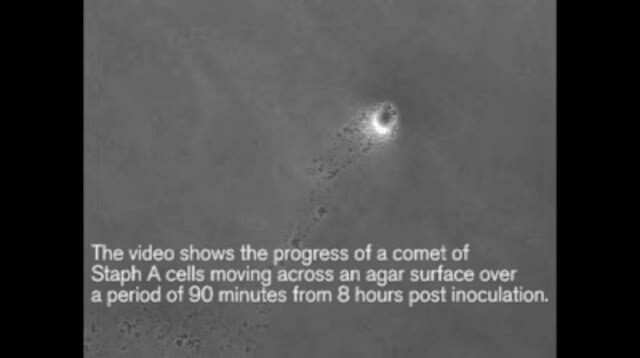 They also observe that under certain conditions, comets can also etch the agar, leaving behind tracks. The moving S. aureus colonies are also capable of avoiding other colonies. The study also showed that the addition of fluid is not able to effectively move comet heads, but can easily move the cells in the comet 'tails'. Dr Eric Pollitt, who also performed the research, said: "It is amazing how the S. aureus cells can stick together and then stay together whilst moving over distances that are incredibly vast compared to the size of the individual cells." The team believes these newly observed and time-lapse photographed behaviours are consistent with active motility, and most closely resemble gliding motility. 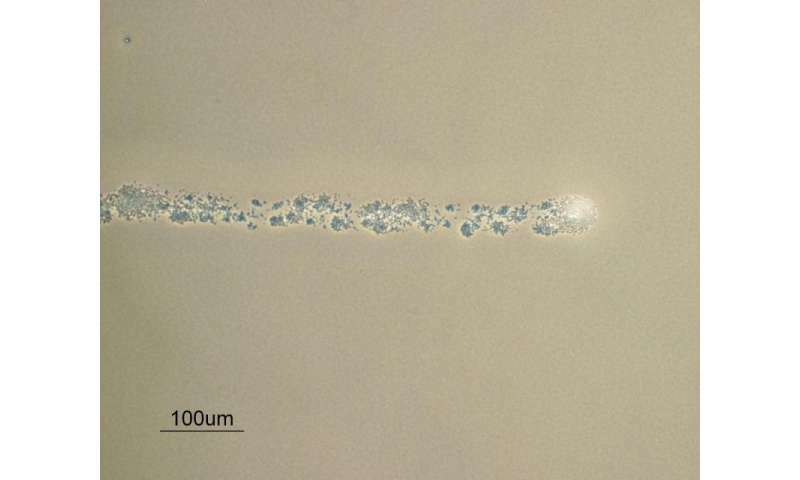 The revelations could inform research into new ways to tackle S.aureus infection as the underlying motility mechanism(s) of the bacteria could be a target for future vaccines and inhibitory pharmaceutical compounds. The researchers conclude that if S.aureus has true motility as indicated by this work, it would be the first example of a Gram-positive bacteria with a typical Gram-positive cell wall moving without flagella or pili. This begs the question of whether other Gram-positive organisms may also be motile in a similar way and opens the way for further research in the area.